Chicken is modern America's favorite meat: The average American consumes over 20 pounds more chicken than beef per year, reports Business Insider. Much of this chicken is boneless, skinless breasts, but you'll save money and get juicier meat if you choose chicken thighs. 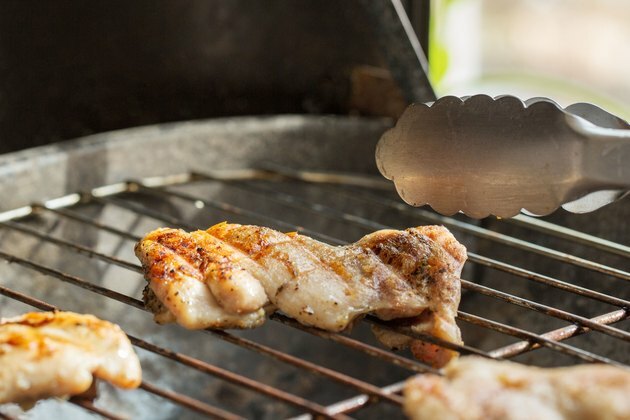 Boneless chicken thighs can be seasoned with your choice of marinade and grilled in less than 15 minutes. Be aware that a serving of chicken thighs contains more calories, total fat and saturated fat than a similarly sized serving of the white meat from chicken breasts. Limit your intake to include chicken thighs in a healthy diet. 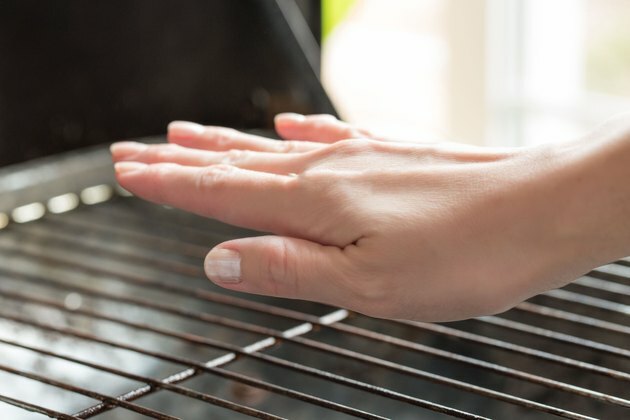 Preheat a gas grill to between 400 and 450 degrees Fahrenheit or, for a charcoal grill, until you can comfortably hold your hand 3 inches over the grill grate for no more than two to four seconds. Use a long-handled barbecue brush to lightly coat the grill with olive or canola oil. 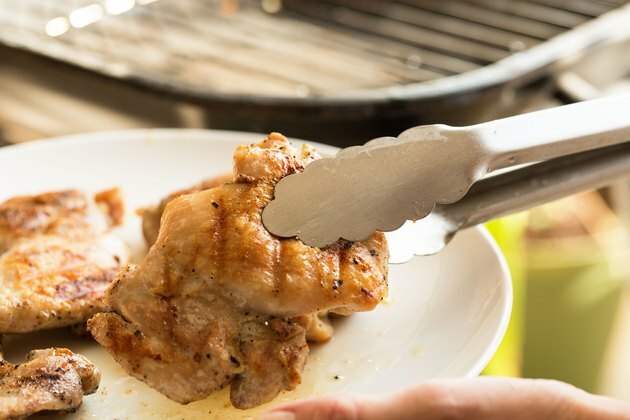 Lift the chicken thighs out of the marinade with tongs. Shake each slightly to remove any excess liquid and arrange the thighs on the grill. Allow the thighs to grill for approximately five minutes, turning them 45 degrees after about two minutes if you want the finished meat to have cross-hatch marks. Turn the thighs over and grill them for five minutes on the other side, again rotating each for cross-hatch marks, if desired. Remove one thigh to a clean plate. Confirm with a meat thermometer that the internal temperature in the thickest part of the chicken has reached 165 degrees Fahrenheit. Remove the rest of the thighs from the grill and serve. For the cheapest chicken thighs per pound, purchase them bone-in and remove the bone yourself. If you grill the chicken thighs with the skin intact, remove it before eating for less fat per serving. 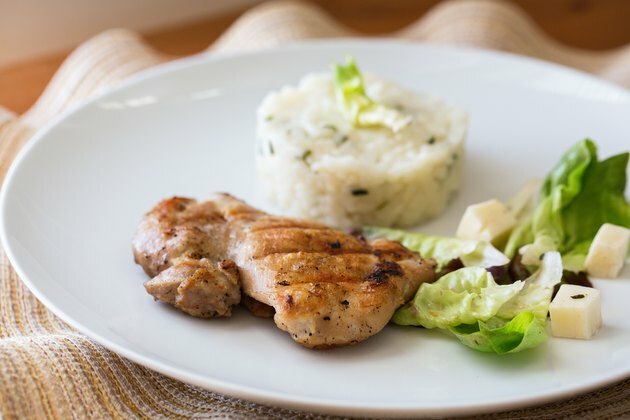 Boneless chicken thighs can be marinated from a few hours up to overnight prior to grilling. Fine Cooking writer Pamela Anderson recommends cutting boneless chicken thighs into chunks and threading them onto skewers before grilling. 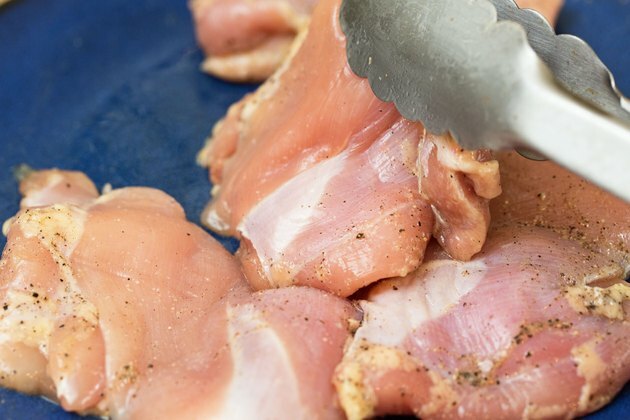 Never use the same plate or utensils with cooked chicken as you used for the raw chicken unless they have been thoroughly washed. Academy of Nutrition and Dietetics: Breasts Vs. Thighs - Which Is More Nutritious?